Pure white apron. Lining is also white. 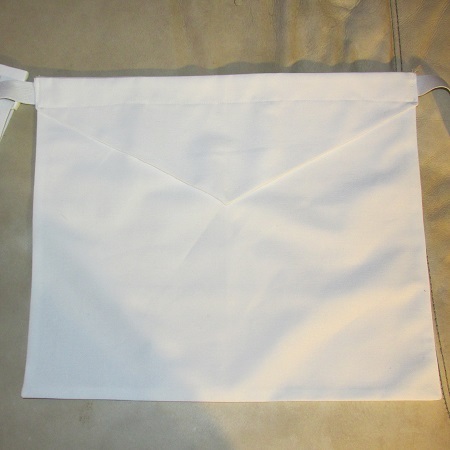 Pure white apron. Both front and back lining are white. Wash gently in cold water. Lay flat to dry or dry on completely “no heat” setting. (The heat of the dryer would cause shrinkage and distortions.) Iron on cotton setting. Front is adorned with 3 inverted "T". 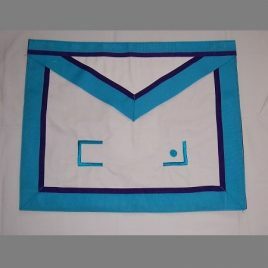 White apron with brilliant blue and purple border. Reverse side is black with embroidery of skull and crossbones and 9 tears. 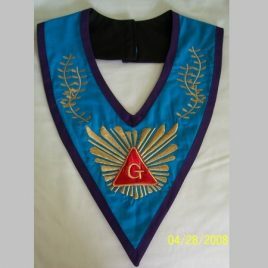 Brilliant blue collar bordered in purple with embroidered insignia. Reverse side is black with skull and 9 tears. 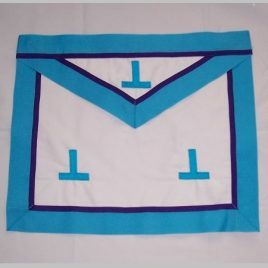 White apron with blue and purple border bearing the insignia of the Master Mason. Reverse side is black with embroidery of skull and crossbones with 9 tears. 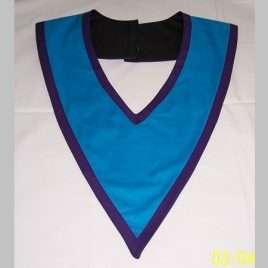 Brilliant blue collar with purple border. Reverse side is black with skull and crossbones and 9 tears.